For the first few months I lived in Spain, my roommate and I often turned on the TV to catch late-night American movies and shows. We bemoaned the fact that all of these English offerings were dubbed instead of subtitled for Spanish viewers, wishing we could hear the familiar voices of George Clooney and Bart Simpson. We talked about how strange it is that Spanish voice actors make a career out of dubbing one particular American actor so that Brad Pitt, for instance, always sounds the same in Spain even though it’s not his actual voice. There’s a reason, though, that dubbing is the only means of translating films and television in Spain, and it’s more insidious than mere tradition. For the forty years that General Franco was in power, he sought to control Spanish society through strong censorship of all “foreign” elements. He even suppressed cultures native to Spain, such as Basque and Catalán, for the sake of creating a unified national identity. Thus, all films and literature that came to Spain between 1936 and 1975 were edited in the translation process to show Spaniards only what Franco wanted them to see. Billy Wilder’s Some Like it Hot, for instance, showed too much immoral behavior for Franco’s liking and so the film in Spain was shown with many of the most humorous scenes deleted. Translation, then, is often more than an artistic pursuit. The reasons that some works literature are translated while other works are not are frequently political, and linguistic choices can be made to emphasize certain elements for the new audience. Indeed, Martin Luther’s translation of the Bible, which asserts that salvation is granted on faith alone (and not through good deeds), led to the Protestant Reformation. I found that my small town in Spain was sorely in need of a translator for neither artistic nor political reasons, but just to make sense. 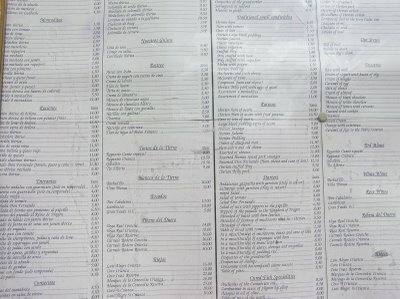 A restaurant near my apartment offered their menu in English and French, and I loved reading the loosely translated names of their dishes. Aged sheep cheese became “Cheese of sheep old man,” while a bread basket became “Table of bread.” When they weren’t sure which word to pick from their English dictionary, they just included both translations, neither of them correct: scrambled eggs with blood sausage became “In a mess (untidy) of pudding rice.” And my favorite: “Attacked of fantasy of mushrooms.” With a name like that, who cares what’s really in the dish. You might not think it by seeing the quality of pictures I take on my iPhone, but I won a photography contest once. Granted, the contest was limited to the few hundred people teaching in my program in Spain, but still it rewarded me 100€. Not bad for an amateur, eh? Besides that first place photo I’ve never been particularly proficient with a camera, but have long admired the art of photography. The first time I was truly struck by a photographer’s work was when I visited the Reina Sofía Museum in Madrid at the age of 16. We’d gone to admire Picasso’s Guernica, but had an extra couple hours to explore and so toured the special exhibits. One large room was dedicated to Elliott Erwitt‘s work. I was awestruck. Elliott Erwitt is a genius at recognizing and capturing these decisive moments–you have the sense that if his shutter had closed a moment earlier or later the entire picture would have been worthless. After being enamored of his work, I bought a book of his photographs and have often used the images as prompts for short stories. For indeed his photographs make the viewer ask questions–Why is this man leaping? What is this couple thinking as they dance? Are the children afraid of the impending storm? Great photography need not always be of this genre. Ansel Adams accentuated the majesty of the land. Annie Leibovitz creates gorgeous moments and captures her subjects at their most vulnerable, otherworldly, striking. 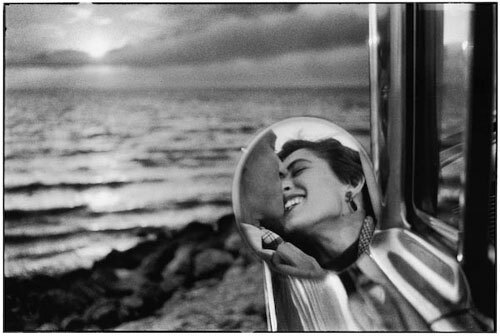 But the surprise of Erwitt’s photography is what I love most. And, I think, these are the kind of images that can get burned in our brains. Like the Tiananmen Square Tank Man. Like the Vietnamese children running from a napalm attack. While some of Erwitt’s photographs are as dramatic as these, he captures the whole range of human emotion: humor, joy, grief, absurdity. 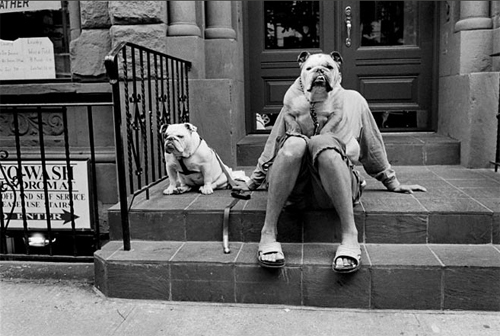 If I were to pursue a career in photography, I’d aspire to shoot like Erwitt. 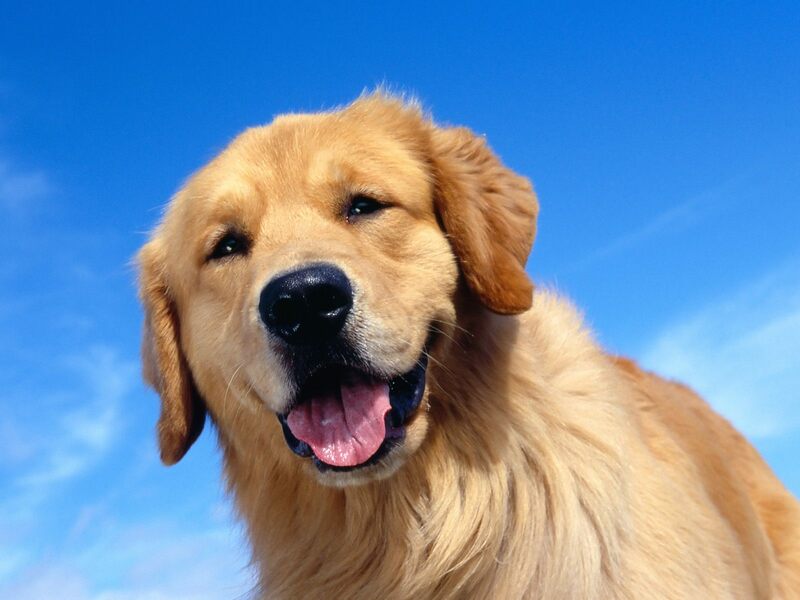 Who can resist a good dog photo? On the multicultural note, it’s interesting–and perhaps somewhat embarrassing–to see which beers are the best-sellers around the world. In the United States we buy Bud Lite more than any other beer. So much for microbrews. Where do breweries go to die? Hopefully, they don’t. Here’s a story of a smart urban planner who found a new use for a wonderful abandoned brewery. (oh yeah, and one of my friends works for this guy). My boyfriend drinks PBR. Pabst Blue Ribbon is the drink of hipsters. Since my boyfriend also wears a lot of plaid shirts, listens to obscure music (he’s a music writer, for goodness sake! ), and bikes any time he can, some go so far as to label him a hipster. He counters with the fact that he’s from a town near Milwaukee, Wisconsin, and locals always drink local beer. This was known and reported on by the New Yorker in 1960 (it’s free if you’re a subscriber, and I highly recommend it as it’s surprisingly hilarious). Some things never change. I’m planning to add more to this beer list in the coming days, so check back soon! I was always “different” as a kid. My parents stopped eating meat while living in Morocco for the Peace Corps and raised my brother and me as vegetarians. My friends would give up meat for Lent to see what it was like, and complain after a few days, wondering how I didn’t have constant cravings for burgers (hint: it’s easy if you’ve never had one). Furthermore, one of my hobbies was doing yoga, a strange-sounding practice that no one had heard of in 1993 in my elementary school (“But I thought you were Christian?” they’d say in confusion). My uncle spent several years living at Kripalu, a yoga center in Massachusetts, learning and then teaching yoga. We visited him often, and sometimes took classes there as well. In a photo album from 1990, my uncle is in a picture-perfect downward dog, while I, all of four years old, am doing my best to imitate the pose next to him. By the time I got to college, yoga was no longer a foreign concept, but I had become a stranger to it: I hadn’t practiced in a decade. Luckily, my college had a PE requirement, which could be fulfilled in numerous exciting ways: white-water kayaking, snowboarding, and yoga. I chose all of the above. I became so enamored of it that the summer after I graduated I got an unlimited pass to a nearby chain-yoga-studio, CorePower. True to its mass-produced nature, every class I took had the exact same sequence of poses. From June to August I appreciated this fact, always knowing what was coming next, and realizing when I could go deeper in a pose than I’d been able to before. By September I was bored. And then I moved to Spain. Somehow I got lucky enough not only to be placed in a town with a yoga instructor, but also to move in to an apartment directly across the street from where that yoga instructor taught her classes. Every Wednesday afternoon my roommate and I would stroll across to the centuries-old monastery and do an hour or so of yoga, led both in English and Spanish (I learned the words for body parts in Spanish really quickly). 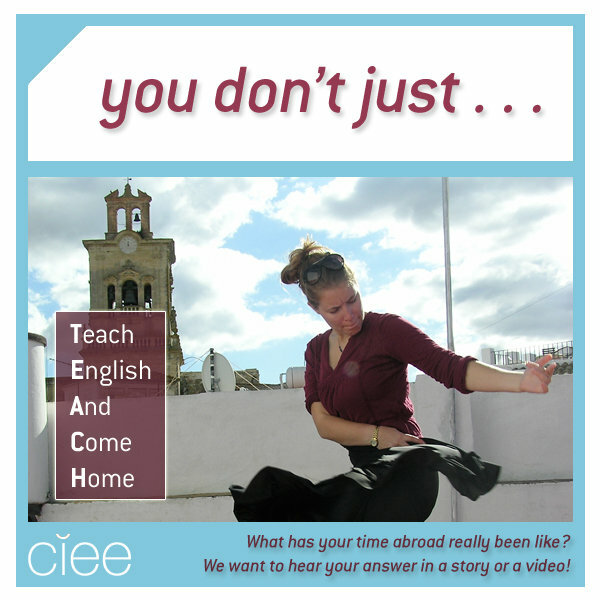 In the springtime our teacher–who had become one of our closest friends–drove us out to the Spanish countryside and we would do yoga in the mountains or facing up at our gorgeous white town. Now back in the United States, I haven’t yet found an analogous class. 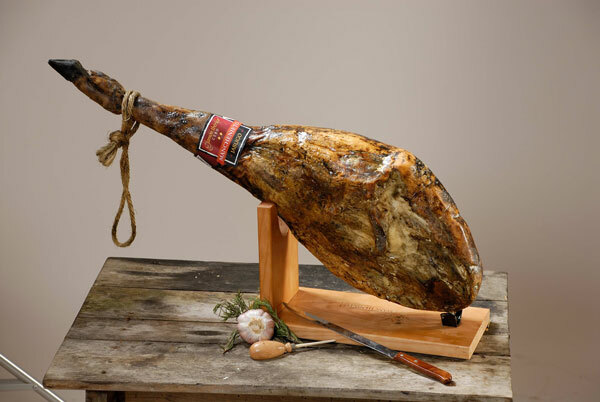 In Spain there were rarely more than about five or six students, so our teacher shaped the class to our capabilities. She knew what we struggled with, and what we were getting better at. I certainly never got bored. I’ve gone to CorePower a few times since returning, but sometimes I notice myself getting competitive, glancing around to assure myself that my leg is higher or my back straighter than my neighbors’. But, of course, yoga is not about competition, and it’s not only about the body. 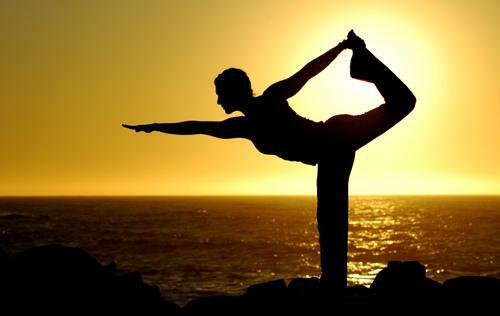 The original intent of yogic practices was to attain spiritual insight and inner balance. And while balance is difficult to find in the midst of a packed schedule and an even more crowded yoga studio, it is certainly attainable in the mountains of Spain. Yoga retreat, anyone? I remember one time as a kid cracking open geodes with my grandfather. It felt like a mini-experiment in mining–you didn’t quite know what you’d find inside. 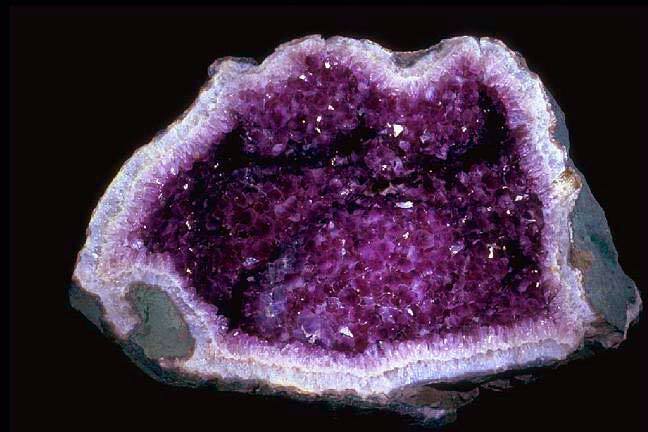 My favorites were always amethyst geodes, those glittering purple cavities inside such ugly exteriors. If we are to believe Greek legend, amethysts were created when a god’s tears turned white quartz purple. Dionysus, god of wine, pursued a young lady, Amethystos, who didn’t return his affections. She prayed to remain chaste, so the goddess Artemis turned her into a white stone. Dionysus wept tears of remorse over her crystalline form, and stained her purple. Having thus chastened Dionysus, amethysts were considered to be strong antidotes to drunkenness, and wine goblets were often carved from it. Geodes themselves are fairly interesting creations, as they form in the cavities of sedimentary and volcanic rock. While the rock layer hardens, silicates and carbonates filter through and form crystals. And then, if a geode is lucky, a Greek god cries on it and turns it purple. 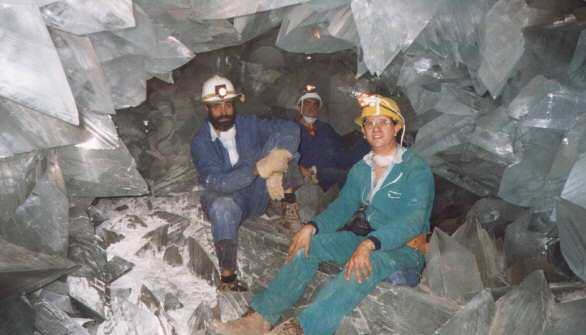 The largest geode in the world was found a few years ago in an abandoned silver mine in southern Spain. It’s 26 feet long and 6 feet tall; it can comfortably seat 10 people inside (however, people are discouraged from being inside it, for fearing of increasing the humidity too much and destroying the crystals). The gigantic geode probably formed when the Mediterranean started to evaporate 6 million years ago, leaving behind thick layers of salt which then filled up a cavity near the Spanish coast. Seems like the gods might have had something to do with that one, too. When the heat arrives in southern Spain, Andalucíans crave one thing: gazpacho. Also: air conditioning. Gazpacho is more readily available. My flamenco teacher in Arcos de la Frontera, Santi, told us that as a child he would eat bowls of gazpacho for dinner in hot months and fall asleep. Waking up from dehydration–gazpacho can be quite salty–he would go to the refrigerator for water, see leftover gazpacho, and down more of that instead. He assured us that real gazpacho only requires a few key ingredients: tomatoes, salt, olive oil, water, and vinegar. Though Santi is a gazpacho purist, I always enjoyed when a restaurant would serve my bowl of cold tomato soup with small sides of chopped onion, cucumber, pepper, and slices of hard-boiled egg to mix in. 1. 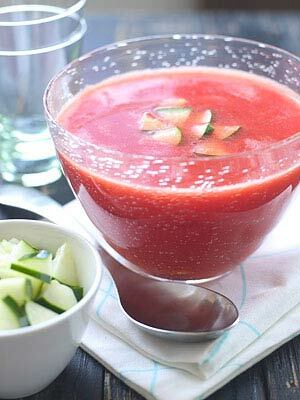 In a large glass bowl, combine the watermelon puree, chunks, tomatoes, cucumber, bell pepper, lime juice, cilantro, ginger, jalapeno, scallion, and salt. Stir well, add pepper and more salt, if you like. 2. Ladle into 4 chilled bowls and serve.